Our closest biological relatives, nonhuman primates, are facing an extinction crisis. While 60% of primate species are threatened with extinction, the great apes of the Democratic Republic of Congo (DRC) are experiencing increased turmoil due to the ongoing conflict occurring within the country.¹ This conflict, fueled by the DRC’s rich natural resources, has lead to a decline in the population of chimpanzees, bonobos and all four subspecies of gorilla, as well as those of numerous other species. The DRC is home to a large portion of the Congo Basin, the second largest rainforest on earth, and is crucial for maintaining wildlife diversity. The Congo Basin houses a wide array of species, many endemic, that cannot survive elsewhere. However, civil war is taking a toll on the DRC’s rainforest residents, both human and nonhuman. Despite 45% of the DRC’s land surface being covered in dense forest, the great apes are not safe within it.² Protected land and national parks are being exploited as laws safeguarding the land are disregarded. Kahuzi-Biega National Park, home to one of the largest remaining groups of endemic Grauer’s gorillas, along with several other national parks, still have occurrences of bushmeat hunting, deforestation and mining.³ This worsening conflict, caused by political instability, is threatening the lives of many, but there are ways to help lessen the war’s impact on great apes. Ironically, the areas that conservationists are trying to protect, contain the natural resources–minerals and forests–that fuel the conflict by providing the rebels with the financial means to operate in the country. Gold, diamonds, cobalt, copper, zinc and the more recently popular coltan (a component in electronic devices), are all found within the DRC. These minerals have garnered attention from major corporations, corrupt governments and warlords, keeping the country divided by giving the rebel groups incentive to continue fighting locals and each other to take control of the mines and the forests in order to stay in power. This has the further effect if keeping the locals living in poverty despite the country’s mineral wealth, an inequality that facilitates the perpetuation of the conflict. The economy of the DRC has been dependent on the extraction of natural resources, including timber, to bring in income. Many policies are in places to keep logging practices more sustainable; the DRC has tried to conserve its national parks, and approximately 60% of its original forest cover remains. However, deforestation is still occurring, including in areas (especially the Eastern DRC) that provide habitat for chimpanzees, gorillas and bonobos.⁷ The process of logging impact the apes because it can change the composition and structure of the forest, leading to fragmentation and making it less suitable for the apes who rely on it for food and shelter. Chimpanzees and bonobos build nests in the trees and gorillas construct them on the ground using the surrounding vegetation. Sadly, the fragmentation also isolates groups of apes from each other leading to inbreeding, which reduces genetic diversity and lowers fitness, ultimately causing a reduction in ape populations.¹ None of these species can survive without the forests. Large surface deposits of coltan and cobalt can be found throughout the eastern region of the DRC.⁵ Coltan is a rare ore most notably used to make capacitors in cell phones and other electronics; demand for coltan has skyrocketed because of the short life cycle of mobile devices.⁸ Cobalt can be found in batteries.³ The increased use of technology and electronics across the globe has made coltan and cobalt desirable to countries around the world. Mining of these and other minerals, provides jobs for many of the Congolese people, including children, who are desperate for money. By selling minerals to different rebel groups or by working for those groups, natives are able to increase their incomes. However, these militia groups pay the locals very little and keep the remainder of their earnings–sometimes millions of dollars–for themselves. They use these profits to buy weapons, which they then use to threaten natives and force them to mine. Weapons also allow fighting to continue between rebel groups who attempt to claim additional territories that contain profitable mineral deposits; some of these sites include areas that were once safe havens for apes. People working in mines (and those in logging camps as well) are not only destroying the habitat, but also hunting apes for food. 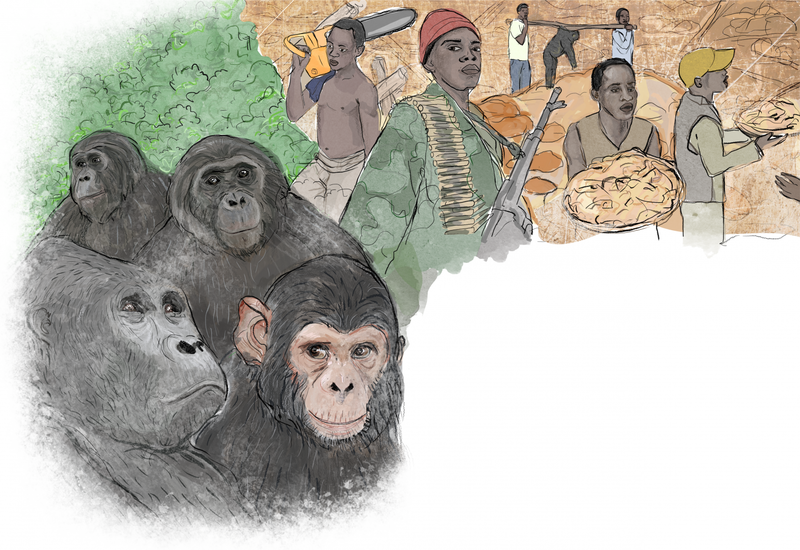 The biggest threat facing apes is the bushmeat hunting associated with mineral mining. The great apes of Africa have immense importance to humans and the ecosystem they live in; losing apes would have negative impacts not just on biodiversity, but also on the human inhabitants of the DRC (and beyond) and on the environment in which they live. Apes have many similarities with humans. They have large brains, use tools and share a similar evolutionary history; studying them can increase our understanding of ourselves and our past.¹ Apes have taught and can continue to teach us about human behavior, learning and more, if we allow them to persist. While the war in the DRC officially ended years ago, the continued difficulties in the country mean that great ape conservation efforts are still of the utmost importance. Through donations to conservation groups working to protect apes and provide assistance to community members, some of the hardships attributed to the residual conflict could be abated. Educating locals about the importance of ape species can be vital to reducing the number of deaths caused by hunting and disease. Another way to alleviate this problem is to decrease the demand for the products coming from the Congo’s illegal mining and timber extraction activities. It is difficult to ensure that a product is “conflict-free”, meaning the coltan and other minerals are not from miners who worked for rebel groups or mined illegally, but it is essential to try.⁸ Supply chains can be hard to follow, but consumers can “shop smart” and support companies that are working to reduce corruption and mitigate the issue by analyzing their supply chains and doing their best to avoid illegally mined minerals. Choosing companies like these can put pressure on other companies to pursue similar policies. If manufacturers only purchased sustainably-sourced resources, the miners of the DRC would be incentivized to either work legally and sustainably or even cease mining altogether. An additional solution is recycling–not just cell phones and electronics, in order to reduce the need for newly mined coltan and cobalt, but also products incorporating other minerals and timber that otherwise would continue to be extracted from forests of the DRC. Lessening demand through smarter purchases would reduce income options for the rebel groups, thus potentially making it possible for the Congolese Army to defeat them. This, in turn, would help decrease the violence, allowing for the eventual strengthening of the Congolese government and a gradual ending to the enduring conflict. If the government regained control, they could more easily enforce laws against poaching, mining and logging, thereby allowing remaining ape populations to thrive and come back from the brink of extinction. 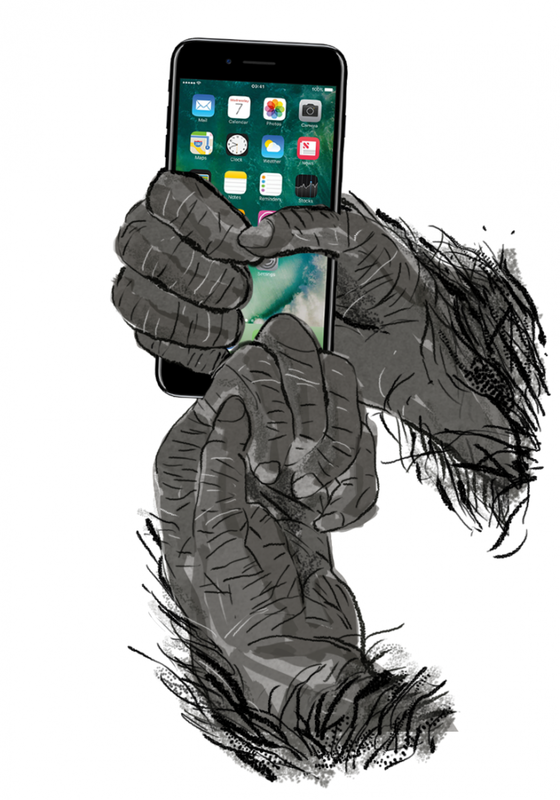 These issues may seem remote to many readers, but people around the world can contribute to ape conservation efforts by sharing information about the issues, the importance of apes and potential solutions–after all, you cannot solve a problem without first realizing it exists. Once people have been educated, they should be inspired to seek out ways to help through donations, recycling and being a conscious consumer–ultimately improving conservation outcomes and helping ensure the maintenance of great ape populations. Estrada, A., Garber, P., Rylands, A., Roos, C., Fernandez-Duque, E., Di Fiore, A., … Pan, R. (2017). Impending extinction crisis of the world’s primates: Why primates matter. Science Advances, 3, e1600946. Zhou, L., Tian, Y., Myneni, R., Ciais, P., Saatchi, S., Liu, Y., Piao, S… Hwang, T. (2014). Widespread decline of Congo rainforest greenness in the past decade. Nature, 509, 86-92. Vogel, G. (2000). Conflict in Congo threatens bonobos and rare gorillas. Science, 287, 5462. Council on Foreign Relations. (2018). Violence in the Democratic Republic of Congo. Global Conflict Tracker. Retrieved from https://www.cfr.org/interactives/global-conflict-tracker#!/conflict/violence-in-the-democratic-republic-of-congo. Plumbtre, A. (2003). Lessons Learned from On-the-Ground Conservation in Rwanda and the Democratic Republic of the Congo. Journal of Sustainable Forestry, 16, 71-91. Ryan, S. & Walsh, P. (2011). Consequences of Non-Intervention for Infectious Disease in African Great Apes. PLoS ONE, 6(12): e29030. Walsh, P., Abernethy, K., Bermejo, M., Beyers, R., De Wachter, P., Ella Akou, M., … Wilkie, D. (2003). Catastrophic ape decline in western equatorial Africa. Nature, 422, 611-613. Moran, D., McBain, D., Kanemoto, K., Lenzen, M. & Geschke, A. (2014). Global Supply Chains of Coltan: A Hybrid Life Cycle Assessment Study Using a Social Indicator. Journal of Industrial Ecology, 19, 357-365. Chrissy Henriques is a graduate student at Miami University studying biology with a focus on primate conservation and awareness. She completed this project as a part of her work with Project Dragonfly at Miami University in Oxford, Ohio. Madhurya Balan is an artist, illustrator, experiential learning facilitator, gardener and re-wilder. She is a believer and practitioner in free thought, speech and choices.